Imagine: A Thoroughbred trainer has five horses competing in an important event at Pimlico on the same Saturday. He needs to find four more excellent jockeys to ensure the horses get the best ride possible in the competition. Fairly normal situation, right? Except these Thoroughbreds chase cows for a living, not the finish wire. Sometimes it really is a matter of the more, the merrier. And when the Retired Racehorse Training Project (RRTP) asked ranch horse trainer Dale Simanton to bring his full crew ranch and cattle-trained off-track Thoroughbreds to Baltimore for the RRTP Thoroughbred Makeover and National Symposium on October 5 and 6, nobody really thought about who was going to ride them. The event, named “Who Let the Cows Out?”, will pair celebrity jockeys with retired Thoroughbred racehorses from the Gate to Great training program of Newell, South Dakota to compete on the Pimlico track in a “team sorting” event. 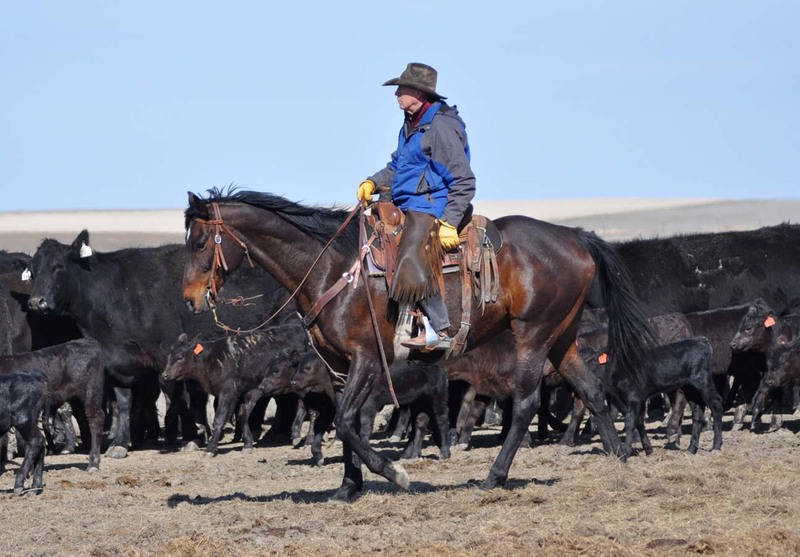 Each team of two horses and riders will have a maximum of two minutes to sort a small herd of numbered cattle into a corral in numeric order. The team with the fastest time and correct sorting order wins the competition. The event requires cow sense, teamwork and fast thinking on the part of both the horses and riders. And to help select the final group of jockeys to appear at the event on Saturday, October 5, the Retired Racehorse Training Project is inviting the public to weigh in on who they would like to see answer the call to the post and mount up for this cow-chasing challenge. An online nomination form can be found on the RRTP’s website at www.retiredracehorsetraining.org. Fans are invited to nominate any rider, active or retired, to “cowboy up” and join in the fun. Nominations will close Monday, September 9. The final group of selected jockeys will be announced on the RRTP website and Facebook page on Thursday, September 12. The “Who Let the Cows Out?” event will take place as part of the “Western Invasion” of Pimlico Racecourse on day one of the RRTP Thoroughbred Makeover and National Symposium. In addition to the team sorting competition, Kentucky Derby-winning owner, Bill Casner, will join trainer Dale Simanton in a team roping demonstration and a barrel racing event with the Thoroughbred Makeover’s own Nikki Egyed and her horse, Symphonic Cat as well as the winner and top four horses from this summer’s Extreme Retired Racehorse Makeover Barrel Race held in Ohio. The western invasion will take place on Saturday afternoon and evening during the Thoroughbred Makeover and National Symposium at Pimlico Racecourse. More information and tickets are available online at www.retiredracehorsetraining.org. 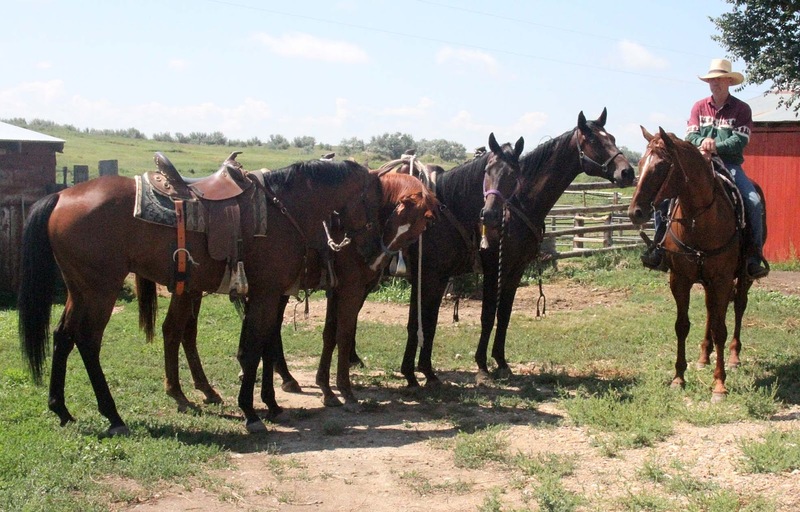 From Left to Right: Thoroughbred geldings Marcade, Race with a Plum, Drake’s Dancer, Swingn Slew and Finn McCool with Dale Simanton up. Additional photos or interviews may be granted upon request. The RRTP Thoroughbred Makeover and National Symposium will be held October 5 and 6 at Pimlico Racecourse in Baltimore, Maryland. The event will feature two full days of educational seminars, meetings, demonstrations, and the culmination of the Thoroughbred Makeover. 26 trainers from 15 states in ten equestrian disciplines will demonstrate what their horses have learned in just three months of second career training. Polo, dressage, eventing, barrel racing, cattle work, police work, hunters, jumpers, natural horsemanship, and tricks will be featured both by the Makeover horses and in special demonstrations from top horses in many of these disciplines. The weekend includes a trade fair and an evening celebration with Thoroughbred Storytelling by very special guests. The Retired Racehorse Training Project (RRTP) is a 501©3 charitable organization working to increase demand for retired Thoroughbred race horses as pleasure and sport horses through public events, clinics, training publications, videos and internet tools. Our mission is to facilitate the placement of retired Thoroughbred racehorses in second careers by educating the public about the history, distinctive characteristics, versatility of use, and appropriate care and training of the iconic American Thoroughbred. More information may be found at www.retiredracehorsetraining.org . 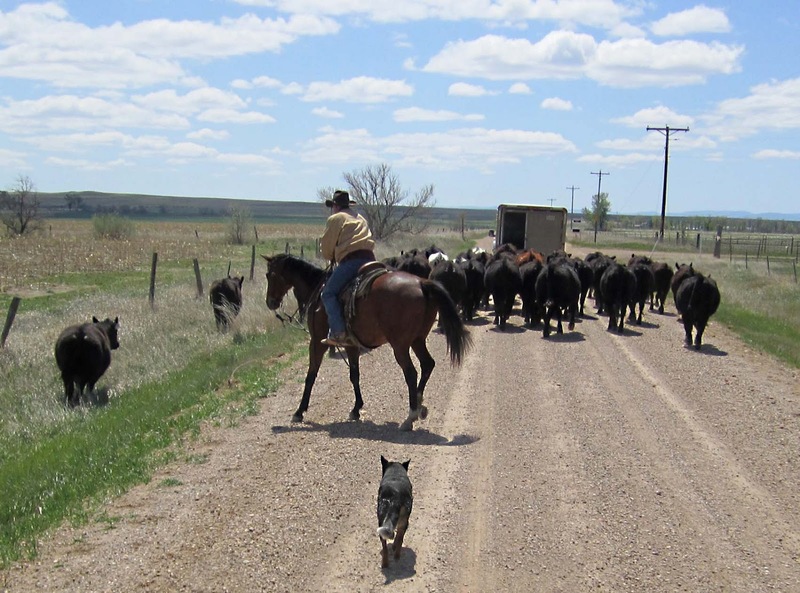 The Gate to Great training program is a division of Horse Creek Thoroughbreds in Newell, South Dakota. 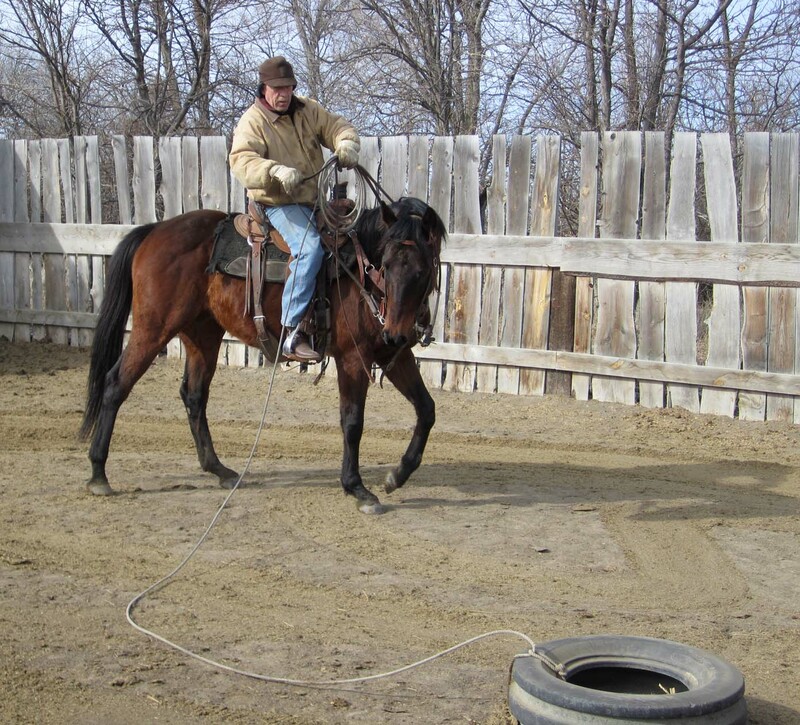 Located on a large ranch in Western South Dakota, the program entails rehabilitation process that gives ex-racehorses a chance to recover from the rigors of a racing career and time to develop new skills outside the backside environment. Horses in the program learn to handle themselves in new ways both mentally and physically as they are ridden across the sweeping expanses of South Dakota ranges moving cattle, negotiating creek crossings and riding over varying terrain, all the while developing reining and maneuverability under saddle. The resultant graduates of the program are ready to move on into new careers in both traditional Western disciplines such as roping and barrel racing as well as eventing, dressage and jumping. More information may be found at www.gatetogreat.com . Cowboys, Cowgirls, Cattle, and Thoroughbreds to Cut Loose at Pimlico! When the Retired Racehorse Training Project announced that 26 Thoroughbred ex-racehorses would appear at Pimlico Racecourse in Baltimore, Maryland to demonstrate their talent for second careers, nobody envisioned a western invasion of Maryland hunt country. The majority of the demonstrations at the October 5 and 6 Thoroughbred Makeover and National Symposium will feature the traditional English sports that Thoroughbreds have excelled in for centuries, but today RRTP announced that the western disciplines will move in on Pimlico in a big way. 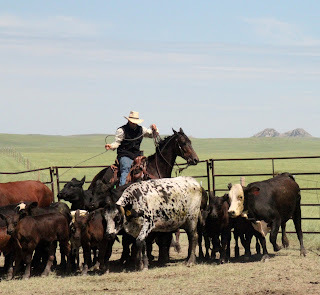 Dale’s South Dakota ranch is home to Gate to Great, a program that retrains Thoroughbreds off the track to do the ranch work typical of western cattle operations. 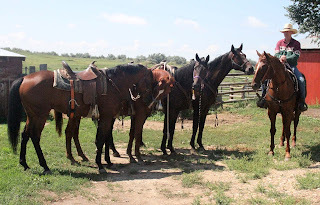 The ranch is also home to what may be the only all-Thoroughbred ranch rodeo team in the nation, a team that will now be making an appearance at the RRTP Thoroughbred Makeover and National Symposium. In addition to his Makeover horse, Drake’s Dancer (aka Duck), Dale will bring four off-track Thoroughbred geldings that are fully trained in ranch work and rodeo competition to wow the crowds at Pimlico. On Thursday, May 23, it was announced that Newell, SD-area horse trainer, Dale Simanton and the “Gate to Great” training program at the Horse Creek Thoroughbred ranch would be a part of the National Retired Racehorse Training Project (RRTP) Thoroughbred Makeover Project for 2013. A former jockey and racehorse trainer, Dale and his team at Gate to Great will chronicle the training of a Thoroughbred that has formerly raced for a second career throughout a summer-long program intended to showcase the versatility and usability of Thoroughbred racehorses once their racing career has ended. The Makeover features a total of twenty-six trainers from throughout the United States, who will select and train twenty-six Thoroughbred ex-racehorses throughout the summer in preparation for a public appearance at the RRTP Thoroughbred Makeover and National Symposium on October 5 and 6 at Pimlico Racecourse. RRTP, a non-profit organization dedicated to increasing demand for Thoroughbreds off the track, received 142 applications from 29 states and Canada. The applicants were professionals, amateurs, and juniors and specialized in ten different equestrian disciplines. The most difficult part about the route we had these cattle on was the bridge that crosses the creek...it is an old wood plank structure and sits about 30-40 feet above the creek bed below. But the worst part about this bridge is that it has no guard rails of any kind, just a roa-width of planks and a long drop to the creek below. 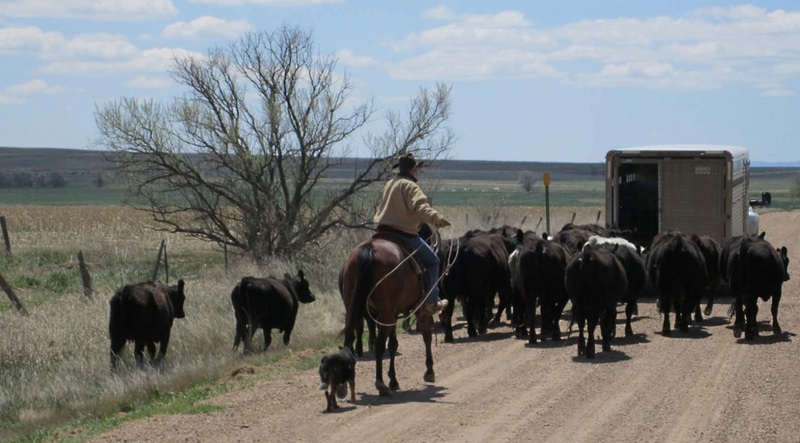 Needless to say, the cows were not terribly keen on making the crossing, which made for quite a lot of work for the riders. 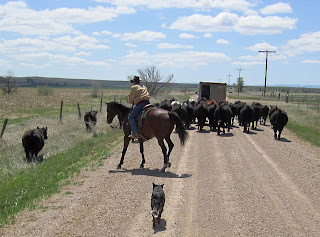 The cows didn't want to walk up onto the bridge and the calves scattered as quail down the road shoulder. Our neighbor, Allen, was trying to "tail" a calf over the bridge, when the mama cow rushed in to claim her calf. Dale placed Columbus between the angry cow and Allen, with calf in tow, to keep Allen from being freight-trained. It was then that Dale found out the hard way that the cow wasn't bluffing, with his horse taking a charge from the cow right between the front legs. I think it scared Dale more than the horse! Before they got everything sorted out, Columbus took a couple more charges to his flanks and face, created by someone else's miscreant cowdog getting into the fray. Even with an angry, bawling cow lobbing him right and left, he never lost his cool--which was a good thing as there was nowhere to escape to other than right off the side of the high bridge. The rest of the ride went more smoothly, with the bold, in "Bold Roar's" name, clearly demonstrated. The photos below show the same road and bridge during a cattle move last fall...you can't quite see the bridge (the trailer in the shot is on it), but you can see the depth of the channel it crosses in the first picture. 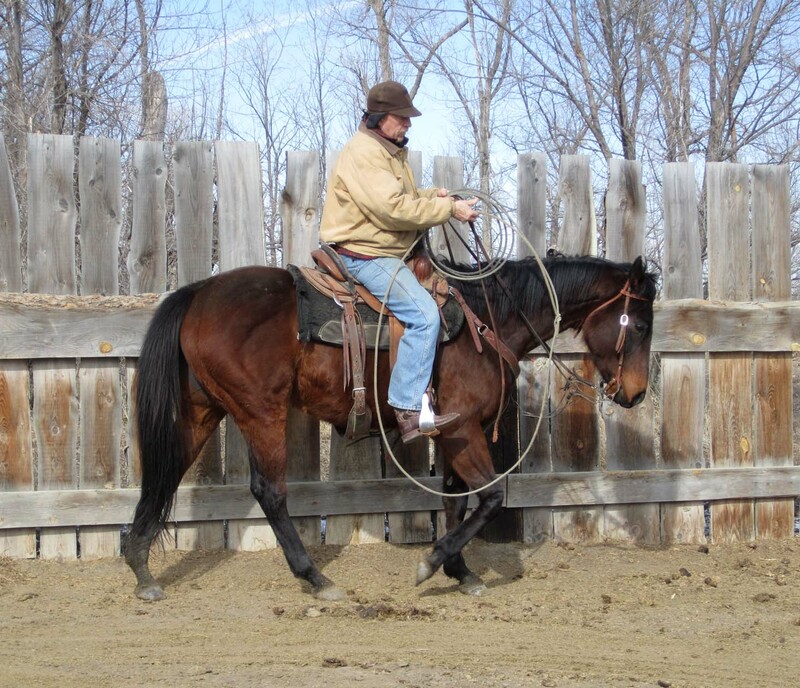 Teaching neck reining is a natural progression that can be broken down into simple elements, as any other skill a horse learns. A Thoroughbred coming out of race training is accustomed to direct rein cues from a snaffle bit, but is typically weak on responding to leg cues, as the shortened leg position of an exercise rider or jockey inhibits the use of leg as an aid. The horse has to learn to work off leg pressure, combined with direct rein, before he can move on to understanding rein pressure across his neck. One problem we avoid is trying to retrain an OTTB that's in race fit condition. In our program, we try to turn a horse fresh off the track out for several months. This also helps freshen his attitude and get over any body soreness or hoof issues. It's difficult to train any horse that is on the muscle, as there is a window of time in any training session when the horse just tired enough to relax and learn, but not so tired his mind shuts down and he becomes resistant. Hope this helps and keep in mind, patience goes a long way toward obtaining results!